It sure has been a while since I’ve posted. I’ve been really busy mostly learning. A lot of time spent on drone photography and videography. I will definitely be posting more since I’ve been learning some fun and I hope awesome new things. Look for a bunch of timelapse videos including a few hyperlapse videos I’ve been doing. So what is a hyperlapse. It’s basically the same as timelapse except the camera is moving. In a future post I’ll share what I’ve learned. Here you go! Enjoy and tell me what you think?! 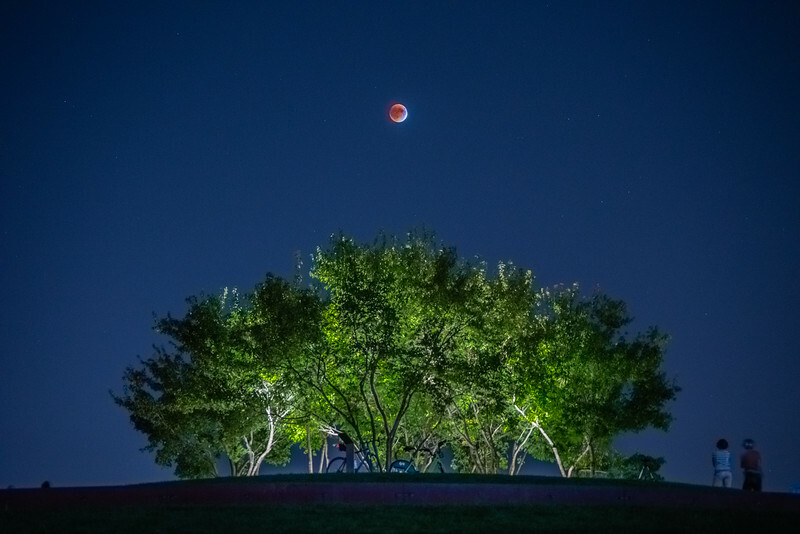 We just had our 4th total lunar eclipse in the past two years. This one was also a Harvest Supermoon. We are getting really good at hyping things. While total lunar eclipses aren’t all that common they aren’t exactly rare either especially after number four. Supermoons are even more hyped. The full moon is something like 14% larger than an average full moon. Considering a full moon takes up probably less than 1% of the sky I doubt most people can see the difference. It seems like there are 3-4 supermoons each year now. A supermoon should be more than just the moon at perigree, which is it’s closest orbit, in my book anyway. I can only imagine the hype for the total solar eclipse coming to the U.S. in 2017. That actually seems like something that is a big deal and hopefully we’re all not so jaded by these sky spectacles by the time it arrives. 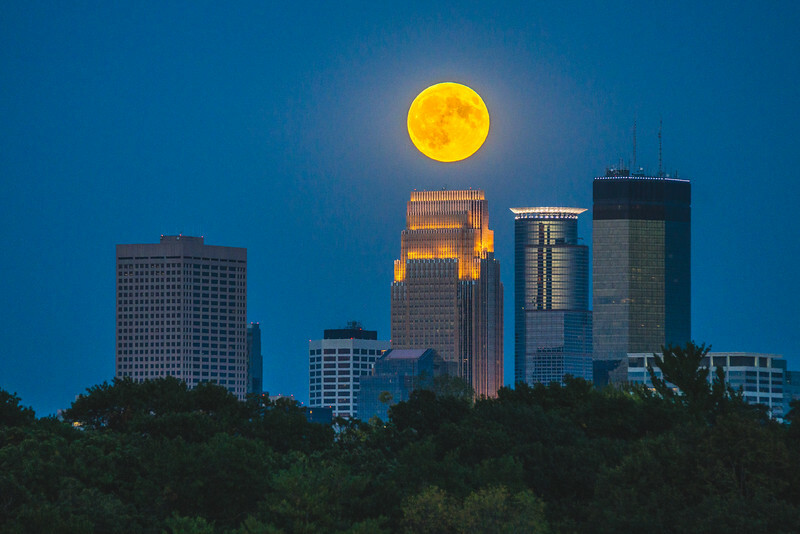 Super Harvest Moon before turning bloody over Minneapolis. 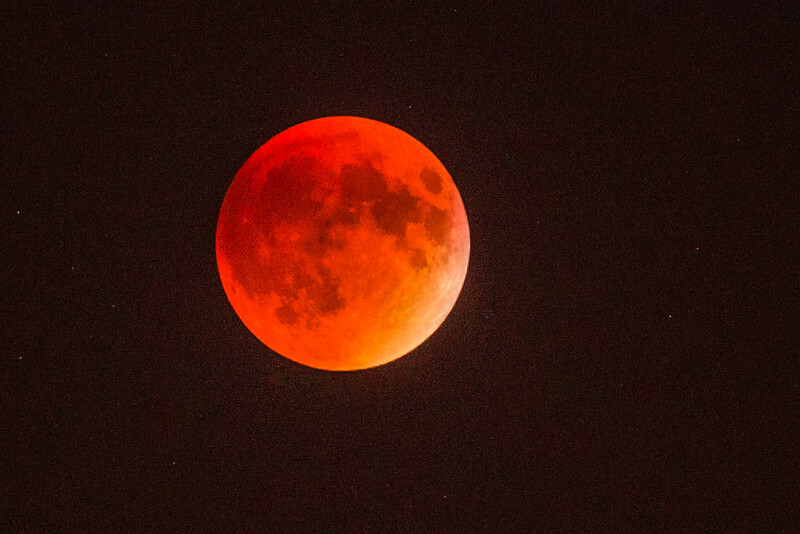 Blood Moon from September 27, 2015. 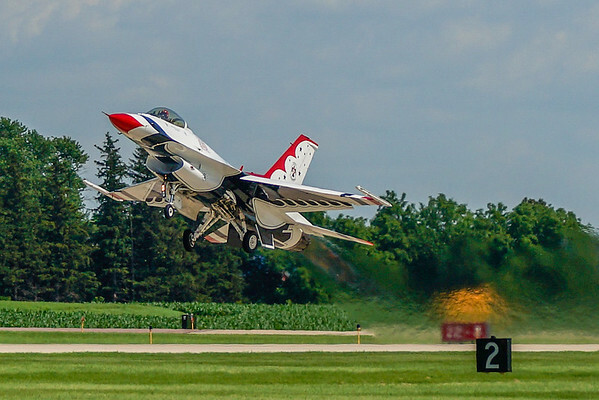 At the end of July I had the chance to visit Oshkosh for the big AirVenture 2015 show. 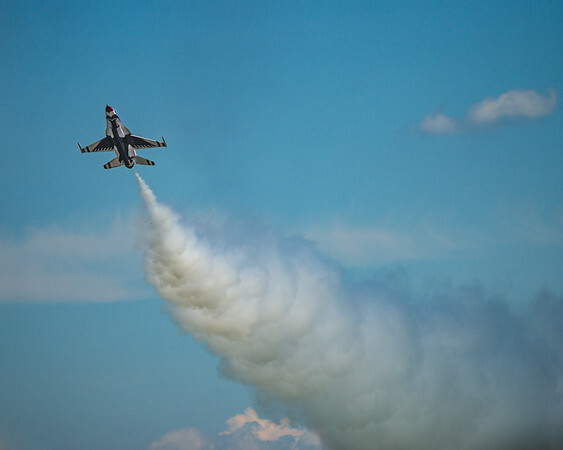 Lots of great acts including the F-22 Raptor, Harrier Jump Jet and an awesome night show. One of the acts that blew me away was the Tora! Tora! Tora! 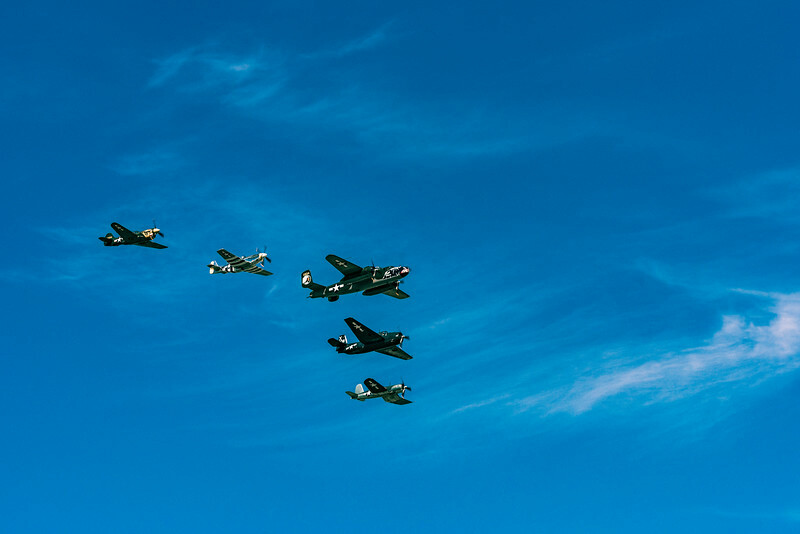 Airshow. What an assault on the senses with great information, narration and beautiful flying. See the full Tora! Tora! Tora! at AirVenture 2015 Oshkosh gallery. Many of the planes were used in the movie of the same name. 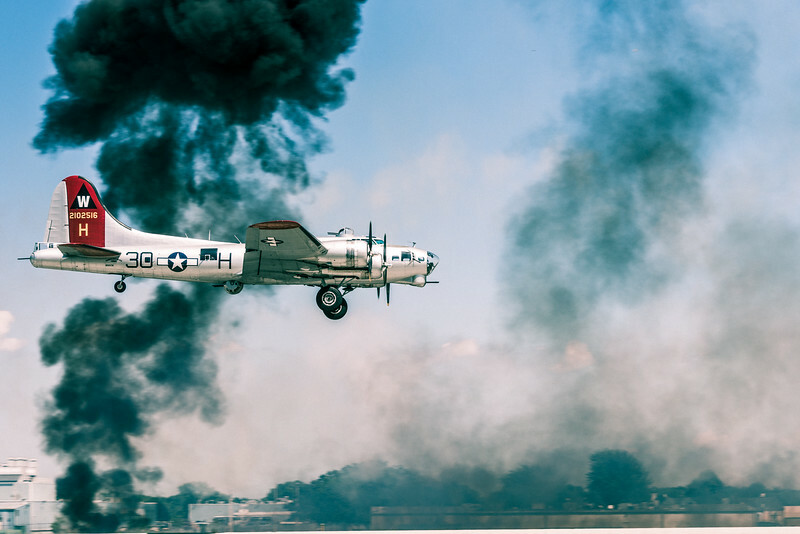 The story follows the history of World War 2 in the Pacific from the surprise attack on Pearl Harbor through the Doolittle raids and culminating in the dropping of the bomb on Hiroshima. It was quite a solemn display. It reminded me a bit of watching Saving Private Ryan where you just wanted the onslaught to stop. They also did a good job of not vilifying the Japanese too much and it wasn’t overly flag waving on the American side. Later on the American war machine gets going. The industrial complex starts to churn out new planes with more advanced technology and the tide turns. 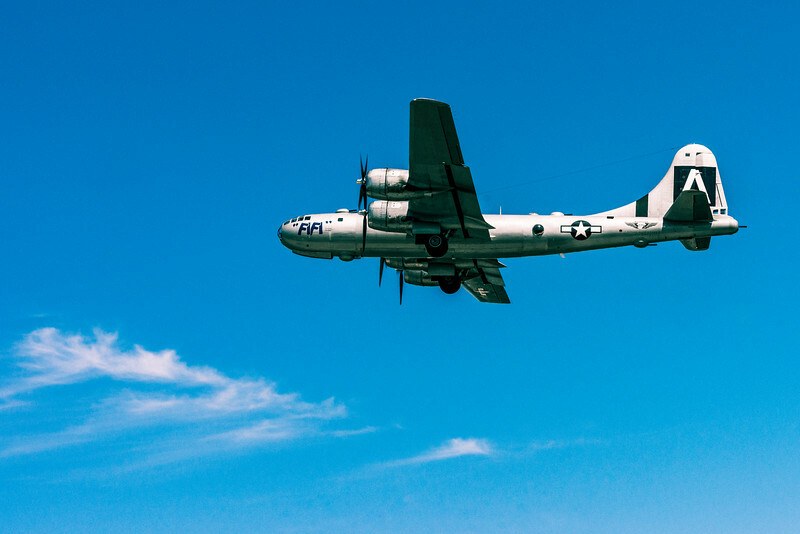 The B-29 Superfortress FiFi stands in for the Enola Gay. 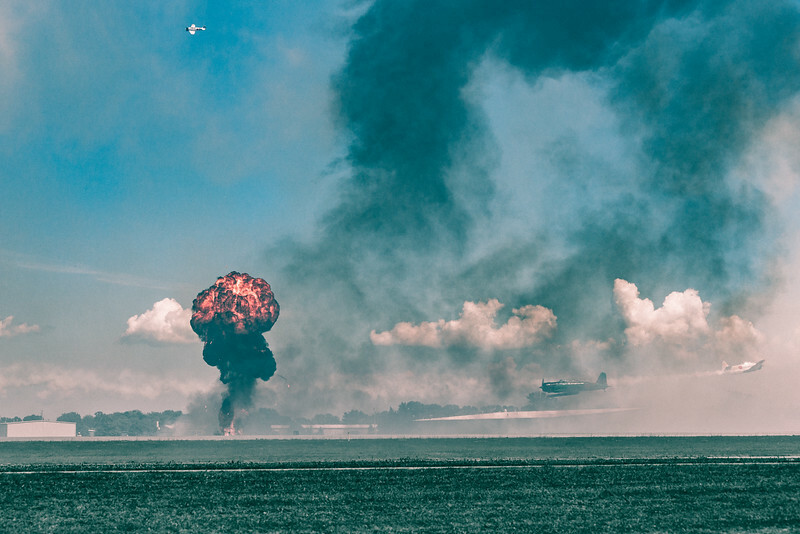 In the final act there is a hush as the B-29 drops the “Bomb” on Hiroshima. It is definitely a must see if Tora! Tora! Tora! comes to an air show near you. Check out their page Tora! Tora! Tora! 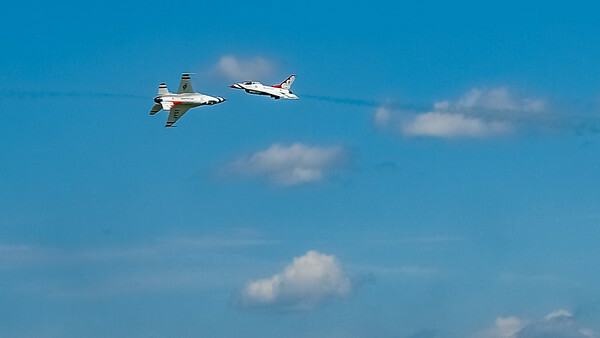 Airshows for more info. 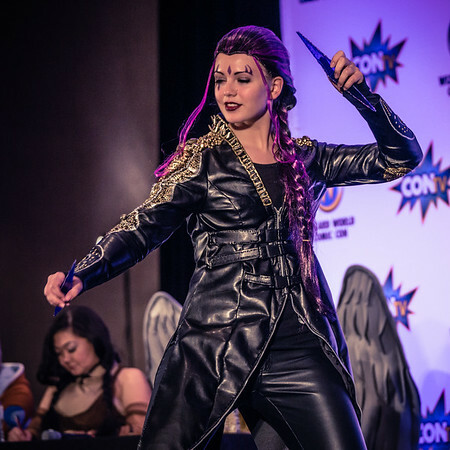 Don’t forget to check out a bunch more awesome photos from the show! The big San Diego Comic Con Convention kicks off this week so I thought I’d share a few more of my HDR Comic Con Fusions. I had a lot of fun with these and plan to do more in the future. I would even like to to do some studio or location work to get better lighting. Those overhead lights at the convention center are tough to work with. 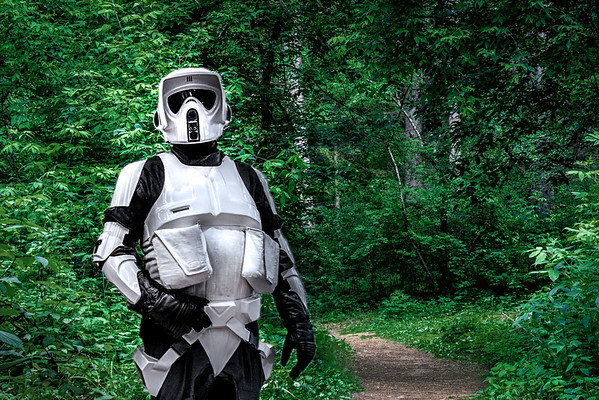 Biker Scout on the forest moon of Endor…of course. Need to have a Star Wars character in anything Comic Con related. The costumes are great and often times amazing like this Biker Scout seen in Return of the Jedi. 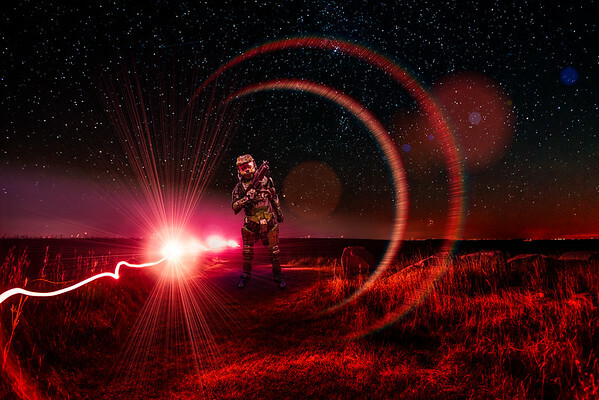 Was fun combining this night scene with Master Chief from the Halo video game. I used Knoll Light Factory to create the crazy flare on this one. The streaking line on the left is some light painting I did on a lonely hill in southwest Minnesota. Who’s that outside the window? This might be my favorite. 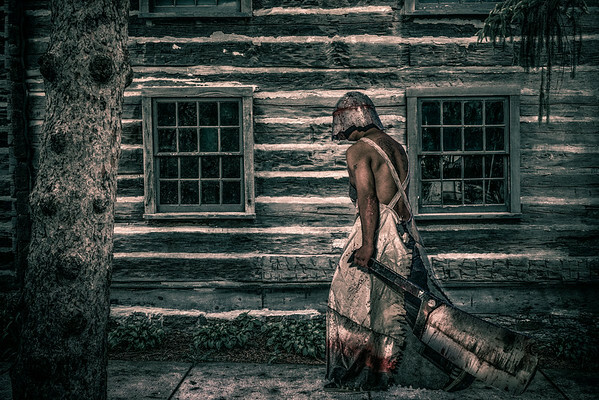 I never played the video game Silent Hill but really like the group of cosplayers that rock these awesome costumes. Here’s the knife guy (I’m sure there’s a name for him) strolling past some windows. It was awesome seeing them lug these big props down the skyway’s of Minneapolis on the way to our Comic Con in May. I wonder if they are on a flight right now in costume to San Diego. I’m sure the TSA won’t mind! Everyone loves Comic Con and everyone (okay most people) love HDR. 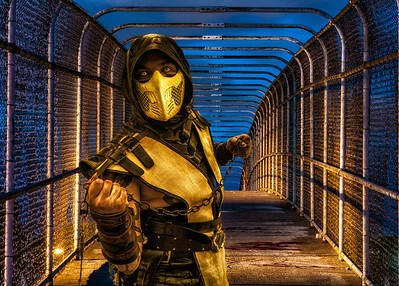 So why not combine the two in a fusion of cosplayers, HDR and compositing. Here are a few of the photos I’ve combined so far. I love the work that Joel Grimes and others have done with HDR portraits and I’ve only seen a few cosplay HDR combinations out there. See the full Comic Con HDR Fustion gallery. 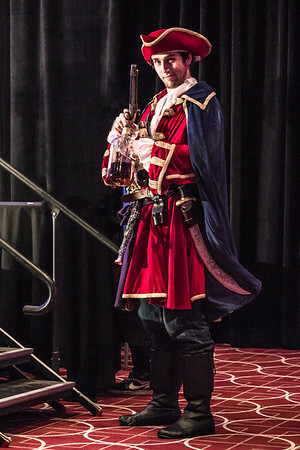 These were all taken from the Minneapolis Wizard World Comic Cons from 2014 & 2015. Looking forward to possibly visiting some of the other sites like Chicago, Madison in 2016 and maybe even the San Diego Comic Con someday. The biggest challenge with using the Comic Con photos is the lighting. Lots of overhead lights beaming down at bad angles. You’ll also need to adjust the color temperatures and exposures of the two photos. In a studio you could control the light much better of course. It’s just maybe harder to get a whole bunch of characters assembled in one place like a Comic Con convention. I plan on combining and sharing a more of these. 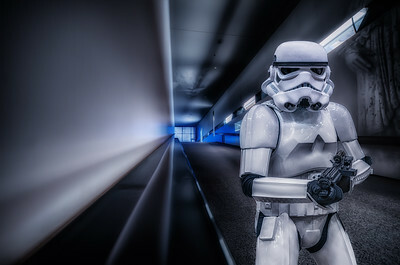 Check out the gallery here Comic Con HDR Fusion Gallery. In this tutorial I’ll give you the basic adjustments to make awesome photos using Snapseed on your phone. If you haven’t tried Snapseed you’re missing out. The best part of Snapseed is the interface works extremely well with your mobile device and as you’ll see it’s a very powerful photo editing tool. Here’s our image straight out of the camera. 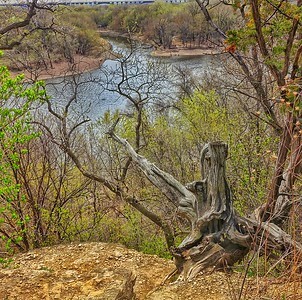 Kind of an interesting tree stump overlooking the river. Probably not going to win any awards especially with terribly flat mid day light. Let’s see if we can spice this up a bit. Click on the edit button to bring up the adjustments. Start with the “Tune Image” adjustments from the Tools section. These may be the basic adjustments but they are also very powerful and will get your image 80-90% of the way to your masterpiece or at least a few ooohs and ahhhs from your friends. Exposure – adjust if necessary. Usually you’re camera will do a great job metering but there are times you might need to adjust this. Contrast – here you can bump up the contrast a bit. This helps with the perception of a sharper photo and gives some punch to your photo. Try +15 to +25 as a starting point. Saturation – for a flat photo like this you can add +25 to +50 to give the photo some life. In good light around sunset you might not need any adjustment or just a small bump of +5 to +15. This isn’t the type of photo you would desaturate although that can be a popular look for portraits. Ambiance – this is one of my favorite adjustments. I push this up to +50 or even more. It gives that HDR look without going too wonky and over the top HDR. From what I can tell it is reducing highlights, increasing shadows and adding some vibrance in one slider. In Lightroom you’d need to adjust all 3 of those separately but here you get it all at once. Apply liberally! Highlights/Shadows – you can adjust these to fine tune but the Ambiance slider might be all you need. Adjust if necessary. Warmth – definitely add some warmth to an image like this. An adjustment of +25 to +40 is probably all you need. Any more and your photo will be overly yellow/warm. Again if shooting around sunset you might need much less or no warmth added. Basic adjustments applied. Not a bad start! Now let’s look at the detail adjustments. You can add a touch of Sharpening but the real meat is with the Structure slider. 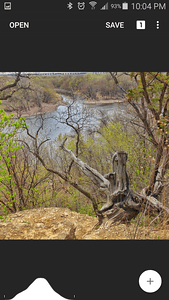 Kick up the slider to +50 or so and you’re adding a lot of character to the textures like the tree stump in the image. Watch out! If you have a really detailed area in your photo adding more structure can cause those areas to become overwhelming. You might think you’re adding more awesomeness but you can quickly overdo it. It’s like adding too much salt to your food. The first bites taste good but then it can become unbearable as your senses are overloaded. The same will go for HDR adjustment in the next section. Next choose the HDR Scape from the Filters menu. You can adjust the filter strength to your liking. Watch out for halos and again don’t create a scene that’s way too busy. An adjustment of +25 to +75 is probably a good range for most photos like this. Note: It’s worth going back to the basic tuning adjustments after applying the HDR to add back Contrast and adjust the brightness/exposure. One of the big mistakes people make with HDR is losing the contrast in an image so be sure to punch it back up if necessary. Don’t miss this last adjustment. It’s similar to one of my favorite plugins in Color Efex Pro called Glamour Glow. It’s a great way to reduce noise, add some warmth and give a bit of a dreamy feel to your photo. Something that’s hard to duplicate straight out of the camera. After adding some glow (or a lot) you may want to back off a bit on the Saturation and Warmth. That’s precisely why those adjustments are present in that filter section. That goes for all of the filters and tuning adjustments. Snapseed does a great job putting the adjustments that interact with one another together. Keep that in mind when making adjustments. Remember these are adjustments for a bland photo that needs some life breathed into it. If you go back and look at the screenshots you’ll see how the histogram is stretched into almost a bell curve. Mid tones are expanded yet there are still bright whites and dark shadow areas. My histograms are usually centered just left of center. I hope this has helped you add some punch to your bland photos and have fun playing with Snapseed and developing your signature look! Here’s a good article on HDR and how it relates to photography and even storm and news reporting. A pretty balanced and informative article. Give it a read. 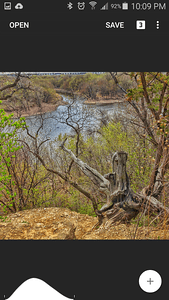 Below is an example HDR in the article. It wouldn’t be Comic Con without girls in sometimes revealing and other times just plain awesome costumes. 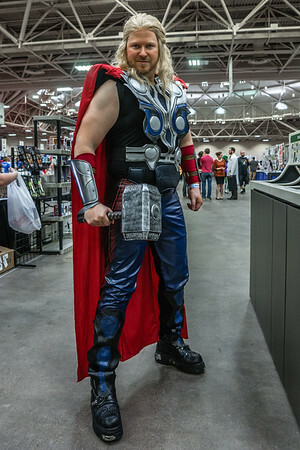 The Wizard World Minneapolis Comic Con was no different with a mix of great costumes. The most popular costumes seem to be Black Widow and Harley Quinn usually with a Joker in tow. Check out the Girls of Comic Con Gallery for more and higher resolution photos. Here’s one of the Harley Quinn cosplayers at the costume contest. The roller skates are a nice touch and the hammer might be the best part with “Squish You Were Here” written on it. We’ll see more Harley Quinn in the upcoming Suicide Squad movie that’s in production with Jared Let, Will Smith and Margot Robbie as Harley. Not since Milla Jovovich wore the “Bandage” in the Fifth Element has there been a more revealing costume! A brave girl although with the pose I wasn’t sure if she was a bit shy or even had second thoughts about the costume. In the next photo however she’s on stage at the costume contest and seems very comfortable. She probably had a few more requests for photos but for the most part didn’t seem to be flocked by guys. Maybe it’s a “Minnesota nice” thing and let’s hope Comic Con Minneapolis stays on the civil side. Some of the other Comic Cons have had some issues with people stepping over the line. Here’s Jinx from X-Men and I thought it was great how she got into character. That’s one of the best parts of Comic Con how the girls and guys all embrace the fun of it. 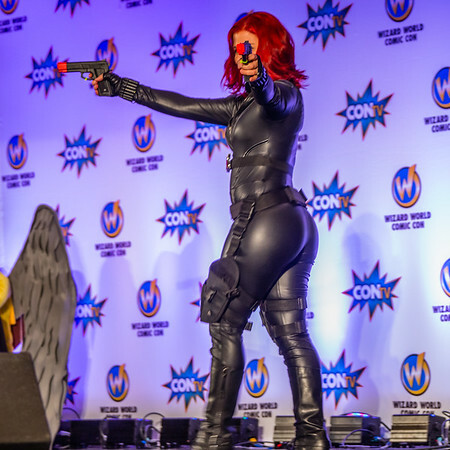 One of the most popular costumes…Black Widow. Of course we can’t mention Black Widow without including one here. Here she is with guns blazing. Yes, I missed her face and no it wasn’t on purpose or because I was distracted. The lighting was terrible in the large conference room and I was just happy to get a shot in focus as she was moving. There you have it. Another successful Wizard World Comic Con for Minneapolis. Check out the gallery for more photos of the Girls of Comic Con 2015. Back with Part 3 of Comic Con and it’s time to summon the heroes…the dudes. To be honest it’s sometimes hard to find guys that aren’t in Star Wars costumes but here they are. The Avengers rule these days. Here’s Thor on the opening weekend of the Avengers movie. 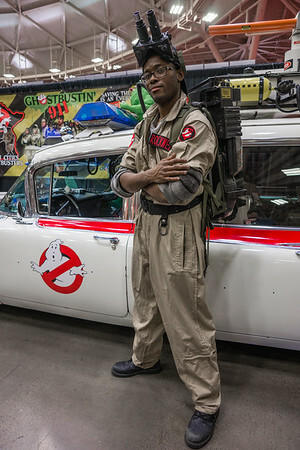 There were a surprising amount of Ghostbuster costumes at the Minneapolis Comic Con. Although hard to pass up the photo op with the car. Which reminds me the Batmobile was there from the old TV show but you had to pay to take a photo of or in it. I can understand paying if you want to be in it. I’d much rather photograph the Ghostbusters wagon or the Delorean. Here’s drunk guy #1. 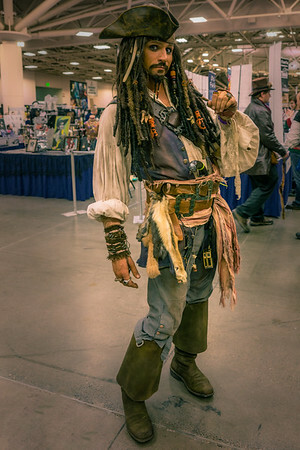 Seriously though he does a great impression of Captain Jack! Drunk guy #2. One of the best things about Comic Con is how people get into character and this guy was all over it as soon as he noticed I was taking his picture. Well done Captain Morgan!